The DreamGirls set the challenge and I accepted! 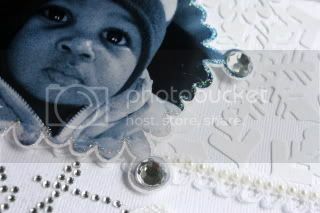 Not only was this my first all white layout, but only one of a few where I didn't use any patterned paper (GASP!) I've found that the secret to creating with all white is texture, texture, texture!!! I started out by spraying an entire piece of cardstock with Shimmerz Baby's Breath spritz and allowing to dry completely. 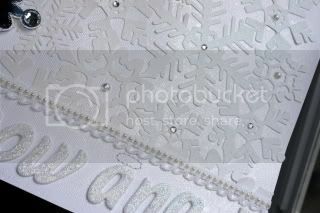 I then took a 10x12 piece of glittery lace cardstock and adhered it to the cardstock with spray adhesive. I covered the seam with a piece of lace and then topped the lace with strips of tiny pearls. 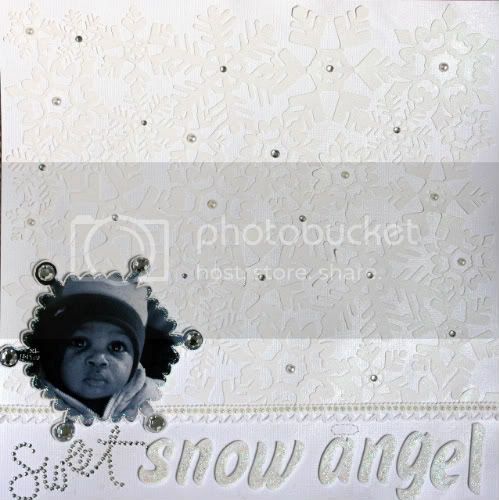 Next, I added pearls and clear rhinestones to the centers of the lace cardstock snowflakes to further add dimension to the layout. I then added the title. Since the rest of the layout is BLINGED OUT, I added stickles to the thickers and then hand stitched a tiny halo above the "a" in "angel". The final pièce de résistance is the adorable photo of my baby boy, Xander. I printed the photo on a transparency--no special technique behind this, I just ran out of photo paper (LOL). To continue with the snowflake theme, I cut the picture into a snowflake, adhered it to a piece of white cardstock, then trimmed it so there was a 1/8" border left. I mounted the photo using foam pop dots and then outlined with stickles. Lastly, I added large rhinestones to the photo. This layout is covered with so much bling, it'll make your eyes water, the shimmering spritz takes it over the top with shine! Close up of the photo-- I sprayed the back of the transparency with spray adhesive and it created a "grainy" look to the photo...love that! Tanisha-- there are no words to describe how absolutely beautiful this page is. It's breathtaking! Thank you so much for how you chose to respresent Shimmerz in this layout.